I finally managed to find some time to play a couple of rounds of ‘Civilization 4: Beyond the Sword’ (2007) and while I’m hesitant to judge it right now, I’m not overly enthusiastic about it (previously.). Particularly considering the current hardware I’m running it on, all across the board (from the custom dialogs to the AI) it is god awful slow. I’ll see if I can revisit this in a separate item. People who’ve followed this blog, should be familiar with the praise I heaped on X3: Reunion (old material right here): I decided to pick up the game where I left it a couple of years ago. Just recently, I decided to move up to ‘X3: Terran Conflict’ (which incidentally, is also available for the Mac): Excellent once again. Since this is the last game in the X-Universe, it’s going to be curious to see what Egosoft (company site) will come up in the near future. Minor update: Additionally, I noticed that in Civ4:BTS for some of the technology discoveries some other person’s voice was used (definitely not Leonard Nimoy’s). 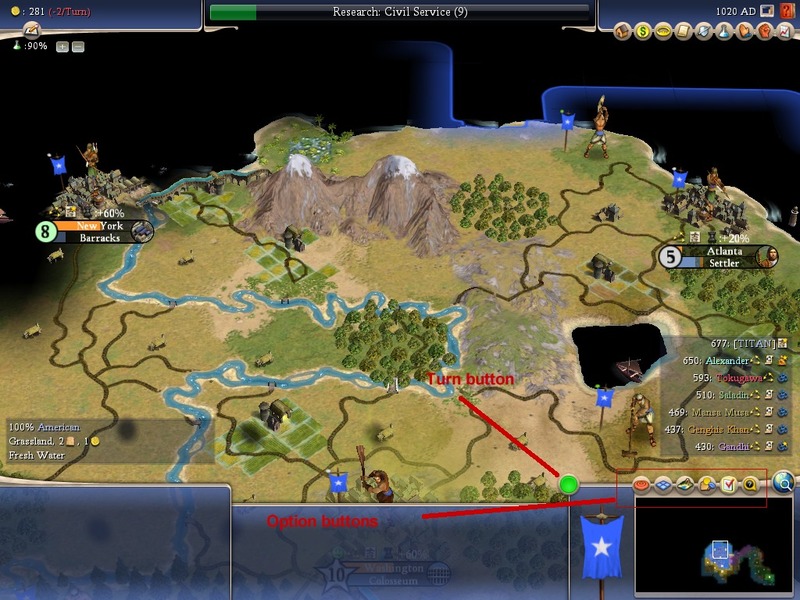 This entry was posted in Civilization 4, Video Games and tagged Civilization 4, PC, X3 on October 25, 2009 by Arthur. Hell, yeah. Actually, I dare to say that that song makes the game. 1 A cappella: music is vocal music or singing without instrumental accompaniment, or a piece intended to be performed in this way. 2 Notice that 2 K Games uses a complete different arrangement of the very same song. (Add. : portion is part of the game’s introduction). Update: I just found out that even in the latest version of WP there’s no way to edit or change attachments. I guess, I have to dive into SQL to correct the typo in that attachment linked in this posting. Or I should rectify this by writing a small plug-in. Oh: and for some freaking scary reason I tend to write attachment as attachement. This entry was posted in Civilization 4 on August 6, 2006 by Arthur. Once again, I missed the World Cup Soccer games: England vs. Paraguay(1-0), Argentina vs. Ivorycoast 2-1 and Trinidad vs. Sweden 0-0. Early this morning I found out that my TSN channel wasn’t in my cable package anymore, something I reported about way earlier, I think. The good news is that ABC seems to cover the games (what? ABC?). Good. I’ll turn my TV on tomorrow at noon 1 2. The main reason of not being able to watch was soccer, was because I decided to play an online game of Civ 4 against the other half of the twin. Obviously, as the older part of the two, I decided to let Alfons win this game. 1 And, I should wear my Orange jersey, I guess. 2 Well, there you have it: the ABC only starts broadcasting at 12:00 ADT, which means that there’s no game, not anywhere on my 30 channels. Something more cheery: The Discovery channel has a rerun of ‘How William Shatner changed the world’ at 11. This entry was posted in Civilization 4, Truro NS on June 10, 2006 by Arthur. If you’re into ‘modding’, the Apolyton site has several user-mods listed, some of them in development and some of them in ‘beta’. Most of the Civ 4 code is in Python and all of the structural data is modelled in XML. Oh, and the summary of changes is right here. Update 1: I noticed that some things have chanced in 1.61. As mentioned it runs faster on my (non-TL-enabled) graphics card. There’s also a graph at the end of the game I don’t seem to recognize. This entry was posted in Civilization 4 on May 21, 2006 by Arthur. After playing a couple of quick rounds of Civ4, I noticed that the latest patch had been released last month: version 1.61, which you can grab from the 2K Games site (maps can also be downloaded separately, Europe, US, Asia, Africa and South America). I see the patch includes a couple of new maps, plenty of multi-player fixes and some random changes to the gameplay like um…. ‘SDI cannot be built before the Manhattan Project’. SDI? What was that again? Patch discussion here. Should see if I have some time to install it. This entry was posted in Civilization 4 on May 9, 2006 by Arthur. The Civilization patch is out! Uh. Wait. It was, but it actually isn’t anymore. Due to a bug that slipped through, Firaxis has put the patch on hold. If you installed it, you can uninstall the patch by using the uninstall option from the Civ4 CD’s startup program. Luckily I’ve been too busy: no time to play Civ 4. Update: Patch 1.09 (23 MB) fixes the Fog of War and other T&L problems, even for my mere Intel GPM card. Civ IV does come up with a message saying that my configuration is actually below ‘requirements’ but allows me to continue playing. Never had that message before, either. This entry was posted in Civilization 4 on November 23, 2005 by Arthur. Some of the highlights include multiple AI improvements and tweaks, worker behavior tweaks, MANY game play improvements (ex Animal Husbandry reveals horses), promotion tweaks, a softer pillage sound (requested by many, many people), fixed diplomatic exploits (gold for gold, peace treaty exploit), multiplayer tweaks (Hot seat, Lobby, etc. ), memory, caching and performance improvements, etc. There were also a number of video card specific fixes. Let’s hope they’re the right fixes. And if they have fixed the black terrain bug, I expect them to give a full (technical) explanation. This is obviously the page that is going to be watch by many Civ4 players. This entry was posted in Civilization 4 on November 17, 2005 by Arthur. I thought this was pretty significant: most of the visitors finding xsamplex are looking for the Civ IV T&L problems described on this site. It’s awfully quiet over at the Firaxis developer blog. This entry was posted in Civilization 4 on November 6, 2005 by Arthur. I have a long night programming behind me: hacking a file format of a DOS based accounting program. Fair enough: no game for me today. Send a scout out to the center of the world (that could have been a name of a movie…) and explore from there back to your city. Not having time to play with the code, I briefly glanced through WorldBuilder.py files and discovered other interesting things. If I have time…. only if I had time. This entry was posted in Civilization 4 on November 3, 2005 by Arthur. Yesterday, I ‘har-harred’ about ‘Edelweiss’, the oh-so-pretty-sugar-song1 from ‘The Sound of Music’, which I thought I recognized in Civilization. Guess what, it’s a music theme triggered when the player enters the ‘Industrial Age’. This had me go promptly back to Windows to find out which MP3 file was just being played. This is actually easy to find out: Check for ‘Industrial’ in the Sountrack folder. Right-click the header, and select the column ‘Last Accessed’ and there you have it. The title of the MP3 is just about descriptive as anything, it’s called ‘Dvorak 9 2.mp3′, which is the second movement of Dvorak’s ‘From the New World’ (or “Symphony No. 9 in E Minor, Op. 95: II. Largo”). Dvorak at Wikipedia, if you feel so inclined. It’s a fitting piece for Civilization: it’d be nice if Firaxis provided complete musical data for these MP3s. A silly aside: when entering the Modern Age, you can choose for the Civ Wonder ‘The Internet': the programmers at Firaxis chose a highly comical icon for this wonder, referring to the inventor of the Internet. I wonder if Al Gore gave permission to use his photo. 1. I was supposed to make a remark here. This entry was posted in Civilization 4 on October 31, 2005 by Arthur. Besides the ‘Fog of War’ bug, game play is good: my laptop is a 512 MB, Intel 82852/82855 GME card (64 MB) with a 2.4 GHz Pentium 4. Problematic is generally the endgame between 20 turns and 5 turns: I expect 1 GB will make a great difference. Turn off virus scanners for sure: I had problems installing the game with McAfee on. CivIII is a joke. On warlord level, the AI is about the same strength as Civ III. However, the Diplomacy AI is stronger than I initially expected. A couple of times I was caught with my pants down when Opening borders to ‘allies’. The music is actually great. Firaxis opted to go for recorded music from major record companies: from classical [Brahms, Bach] to modern [John Adams’ ‘The People are Heroes Now’]. 440 Meg of MP3 goodness. Hey, was that ‘Edelweiss’ I heard there? Har-Har! The titel song is actually great for a change. It be nice to see a credit list for the music. This entry was posted in Civilization 4 on October 30, 2005 by Arthur. Finishing one game of Civ4, I did another try and ended up with an ‘endless’ black map. I gave up at 1200 AD: the blackness, it hurts. In the CivFanatics link above, there’s a good description what the bug exactly is and how to get around it. Next game: I’m dreaming of a clash between Taoism and Christianity. Add 1: There’s another proof that the game was rushed out: the game comes with two disks: disk one is the install disk, disk two (presumably) is the ‘play’ disk. Guess what: to play the game you actually need disk one. Add 2:Another weirdy: there’s a long disclaimer about the use of religion in the game’s manual. Two paragraphs, concluding with: “We mean no disrepect to anyone’s beliefs. We’re game designers, not theologians”. Hey, did you know it’s really hard to stop religion in the game? Civ 5 should at least add the religion gene factor. Add. 3: Re: add.2: The introduction sequence of every game details the start of life on earth according to the principle of evolution. Game rates: ESRB Everyone 10+ Violence. Watch for labels soon saying “this game is based on a theory, not a fact”. This entry was posted in Civilization 4 on October 29, 2005 by Arthur. I had a hard time at the start after installing the game: while my graphics card is obviously out of date, at the start of the game the main map was completely ‘black’. It took over 10 turns to have the map to get colours and that’s when (slowly) ‘land silhouttes’ started to become visible. It has to do with the game and apparently colours start to appear when your ‘first city’ starts to expand. Completely different than previous Civs: I almost figured it was time to find another computer to start an install (something I may consider). The game (upto Medieval times) is good and responsive, playing with 5 AI opponents. The AI (definitely) focusses first on ‘diplomatic’ solutions. The game is reasonably fast: zooming in and out on the map goes smooth. While I could just dive in the gameplay (experienced Civ player), I noticed that there’s a lot of ‘religion stuff’ going on in the background. In Civ 4 you can also try to spread the word of your religion, which may (or may not) be fun at the end of the game. There are several things specialized: you can for example build cattle farms, farmland, workshops, cottages and others around a city. This feels weird. This entry was posted in Civilization 4 on October 28, 2005 by Arthur.